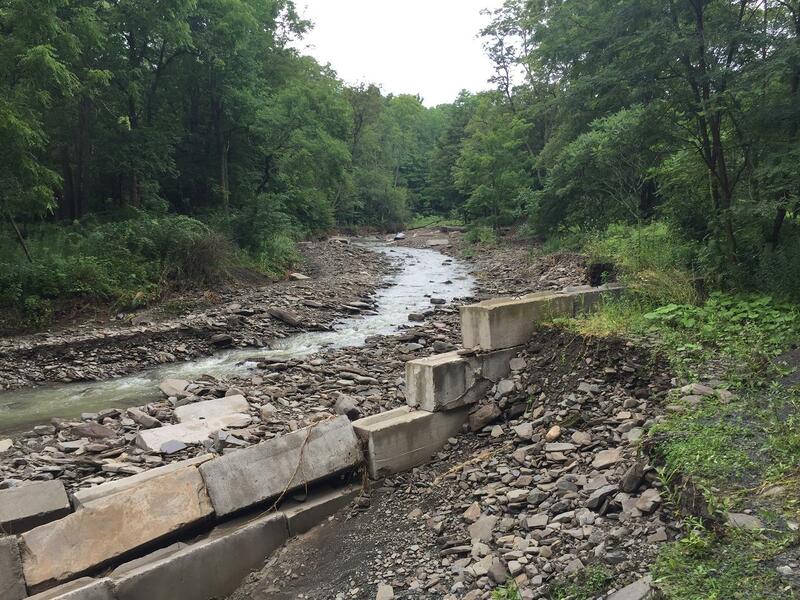 Recent flash flooding in northeastern Bradford County led public officials to consider resurrecting a comprehensive plan for stream mitigation that was developed by its Conservation District in reaction to disastrous flooding in 2011. Bradford County Commissioner Doug McLinko began an uncommon Wednesday afternoon meeting by addressing the press core with a request to help the public understand that recent reports about the county getting involved with stream mitigation was by no means a move toward any sort of legislation or mandates. There was great public outcry after the 2011 floods that streams needed to be dredged and that state bureaucracy was the only thing standing in the way of preventing future disasters. Bradford County was proactive in appointing then County Conservation District director Mike Lovegreen to oversee a comprehensive study and plan to approach stream mitigation. In the meantime, federal and state funding provided relief for many of those effected, most bridges and roadways were repaired, and severe weather eluded the region for the next couple of years. Calls to rebuild stream banks and remove gravel bars dissipated as the immediate threat waned. The Emergency Reclamation Plan, which included a training program, was all but forgotten. “Every stream has been profiled,” Commissioner Daryl Miller related on Aug. 23. 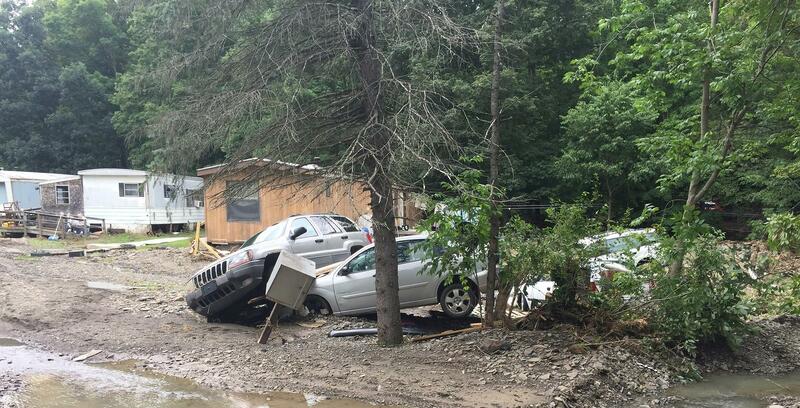 In the wake of flooding on July 24 that affected areas where high water had never been experienced to such extremes, the commissioners participated in discussions between Windham Township supervisors, DEP assistant director Jarod Dressler and regional liaison Dan Viella. The commissioners agreed that it was time to reinvigorate the Conservation District’s plan before it figuratively grew any moss. “We need to do a better job of educating people on the removal of trees and other blockages,” Bustin explained. There’s still protocol involved with emergency repairs, he cautioned, but municipalities are not helpless. Bradford County has asked DEP officials to participate in a forum for township supervisors, borough council members, and crews interacting with state officials. It will be held at Athens High School on Thursday, Sept. 28 at 6 pm. “We want to give resources to the municipalities to protect their own interests,” said McLinko. “This is a tool to which they can avail themselves,” Miller added. Those resources would include a county-wide permitting process, lists of qualified contractors for landowners, and training on managing streams in an environmentally-friendly way. The latter is especially important in mountainous rural regions where rain provides the headwaters for larger watersheds. 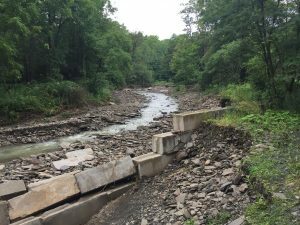 Much of the damage experienced on July 24 in Windham and Warren townships occurred along Russel Run, Spring Run and Little Falls Stream. “We’re going to use this as an educational session,” Bustin said of Sept. 28 event. He and his fellow commissioners expect the learning to be a two-way street, hoping that Harrisburg can do better at taking cues and managing requests from local officials. “We’re looking at this as a pretty cooperative series of discussions that we’ve been having and will continue to have. “We want to make sure that the message is streamlined and focused,” Bustin remarked, adding that one potential outcome might be better predictors of where extreme flooding could happen.